5 days to the Sept. 24 preliminary. City Councillor At-Large Felix Arroyo gets the early bird award, with a schedule entry that puts him at the Freeport Bus Yard at 5:30 a.m. District 5 Councillor Rob Consalvo starts the day at his home in Hyde Park and has 15 events stops planned. The amped up schedule, which Consalvo plans to repeat every day until the election, is part of the campaign’s “All in for Boston” tour. State Rep. Marty Walsh greets city workers heading into City Hall (no word on whether he’ll be joined by a bulldozer). The last big forum before the preliminary is scheduled for tonight at UMass Boston and sponsored by the Boston Foundation and WBUR. The radio station’s Meghna Chakrabarti and Bob Oakes will moderate. BOSTON TEACHERS UNION MAKES ENDORSEMENTS OFFICIAL: On Wednesday night, the Boston Teachers Union, with little dissent, voted to back City Councillor At-Large Felix Arroyo and Councillor Consalvo. The union also cut $5,000 checks for each candidate, though Consalvo’s campaign said late Wednesday night that they would turn it down. The campaign cited its version of the People’s Pledge, a bid to keep outside spending from affecting the mayoral race. The union said it will likely spend an additional $5,000 – they’re limited to spending $15,000 – on robocalls or online advertisements. Richard Stutman, the head of the BTU, said about 200 people attended the meeting at their headquarters. “These are two people who distinguished themselves at our forum,” he said of Consalvo and Arroyo. 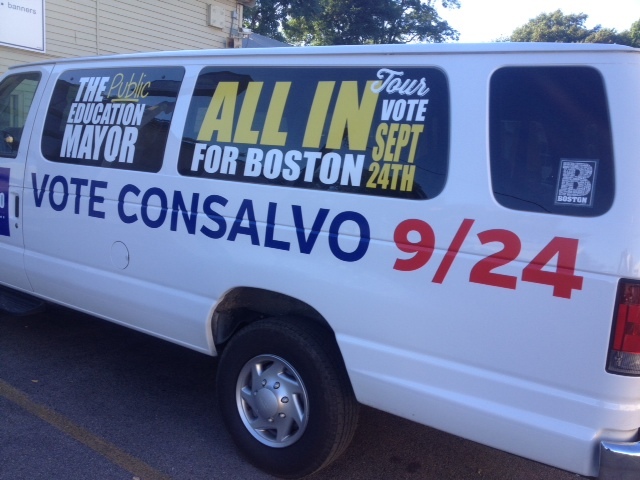 ODDS & ENDS: State Rep. Walsh’s campaign releases an ad that’s web-only for now, spotlighting a beneficiary of a program the lawmaker created as head of the building trades…..There is a Consalvo Campaign Van. Yes, of course we have a picture…..Former state Rep. Marie St. Fleur appears in a YouTube video promoting candidate John Barros…..The folks who made the Massachusetts Fifth Congressional District ad featuring liberal state Rep. Carl Sciortino and his conservative father also made the ad that showed District 8 Councillor Michael Ross running through Boston, distributing his mayoral platform, we're told…..Details from the Suffolk University/Herald poll are available here. Ironside Grill, 25 Park St.
UPDATE: This post was updated at 10:34 a.m. with the Ross schedule.